Sol. Step 1: Construct ΔABC using SSS criterion. 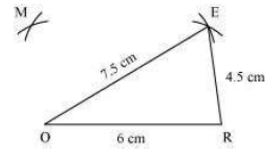 Step 2: Keep A as centre and draw an arc of radius 6 cm on the opposite side of point B. Step 3: Draw an another arc keeping centre as C of radius 4 cm, such that it intersects the arc drawn in the above step. 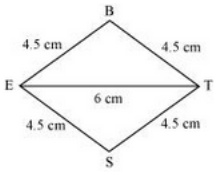 The intersecting point of both the arcs will be point D.
To complete the quadrilateral ABCD, join points A and C to D.
Sol. Step 1: Construct ΔJUP using SSS criterion. 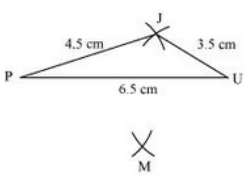 Step 2: Keep P as centre and draw an arc of radius 5 cm on the opposite side of point J. Draw an another arc keeping centre as U of radius 4 cm, such that it intersects the previous drawn arc. 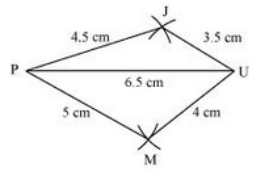 Let the point of intersection be M.
Step 3: To complete the quadrilateral JUMP, join points P and U to M.
Step 2: Take O and E as centres with arcs of radius 4.5 cm and 6 cm. 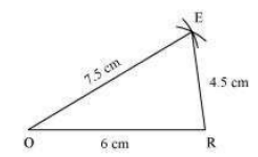 These two arcs must intersect and this is the point M.
Step 3: To complete the parallelogram MORE, join O and E to M.
Step 2: Keep E as centre and draw an arc of radius 4.5 cm on the opposite side of point B. 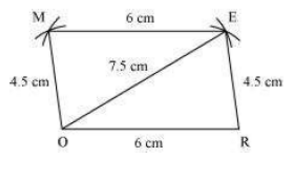 Draw an another arc keeping centre as T of radius 4.5 cm, such that it intersects the previous drawn arc. 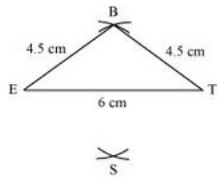 Let the point of intersection be S.
Step 3: To complete the parallelogram BEST, join E and T to S.